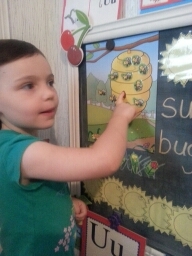 Great fun in Phonics time when AbiNoelle “tasted” the honey after saying Mrs. Pintar’s letter sounds. There’s “shocking” things like bees making honey or feeding Ducky Duddle during phonics time and “awe” things like meeting Sparky the dog at numbers time – all while adapting to the structure of a school schedule, environment, and procedures. It was even more fun to eat Ducky Duddle’s leftovers! It was so fun to feed goldfish to Ducky Duddle after answering the letter sound Mrs. Pintar asked. Of course, for a busy, energetic AbiNoelle, there was much to learn about school behavior. “Am I being big, Mommy?” – was the repeated question. She did her best to sit “Big” for her teachers. To listen with your ears, watch with your eyes, and think with your brain = being ATTENTIVE. Using these skills can be quite the challenge, but the reward is awesome when you get to have so much fun learning and knowing that God is pleased with your best effort. 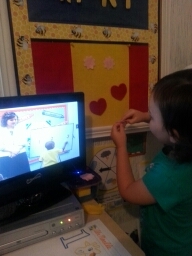 While Mrs. Pintar’s class counted felt objects, AbiNoelle counted at our felt board. She loved all the activity of numbers time with Mrs. Pintar – playing, jumping, clapping, “Pincher-finger” claps, our buckets full of objects to count, felt objects to count, ice cream cones and sunshines to count on our board (pretend, of course:), and, you got it, Sparky the Dog who helped us count. Tracing Itchy Inchworm’s yellow grass. 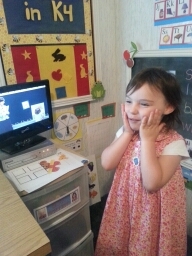 Anticipation was HUGE for her first writing class. Writing is when she gets to learn how to write BIG like mommy and daddy (well, maybe we won’t mention daddy’s handwriting skills!). Ever so carefully, AbiNoelle listened to Mrs. Pintar’s instructions, held her pencil correctly, followed her words, and did her best on her very first cursive writing paper. 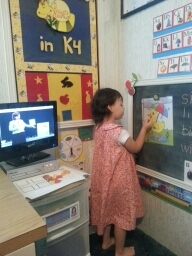 She even had fun writing like a teacher on the chalkboard as she traced little “i”. Bible time with Mrs. Wasser was full of many new things to learn. 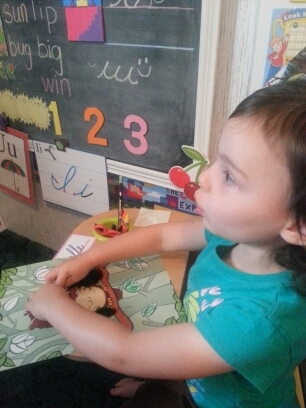 She loved singing “With a ra-ta-tat-tat,” and “The Wonder Song”. 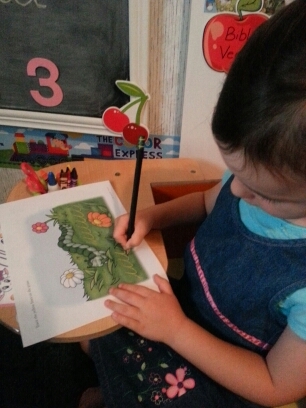 She successfully quoted Genesis 1:1 and put a sticker on her Bible verse chart (She has already memorized Gen 1:1-5 and is now working on verse six). What a blessing to hear Mrs. Wasser teach of our “Powerful” God that created the world, the three Persons of the Trinity, and of how precious God’s Word is to all of us. In one Bible lesson, Mrs. Wasser began teaching “The Lord’s Prayer.” As the teacher quoted, AbiNoelle asked the question about temptation. I quickly explained the word, so that we could continue listening to the teacher. Later, we talked again about “The Lord’s Prayer,” and I told AbiNoelle that we should start memorizing that for Mrs. Wasser. “Oh, Mommy…” And that infamous hand came up to stop me. “I already know that!” Yeah, right, I thought. We haven’t learned that yet. So, I began quoting it to AbiNoelle. “Mommy, Mommy, I want to say it all by myself!” “OK,” I said in my mommy-knows-best sort of way, but to my shock, she quoted much of “The Lord’s Prayer.” You see, at rest-time and bed-time, she always listens to audio Bible stories and apparently one of those stories includes “The Lord’s Prayer.” So lesson learned: THEY LISTEN AND LEARN ALL THE TIME! Now is the time to teach. Pour all the good and godly learning you can into them. Their little minds will soak it up, sop it up, squeeze it out, and come back for much, much more….and what’s mommy and daddy’s job? To be always ready with much more fun learning!